While it feels a bit brash to post this as part of a particularly violent page, I am compelled to support a fellow comicker. Above the Clouds is an all-ages fantasy comic about the power of storytelling and imagination. 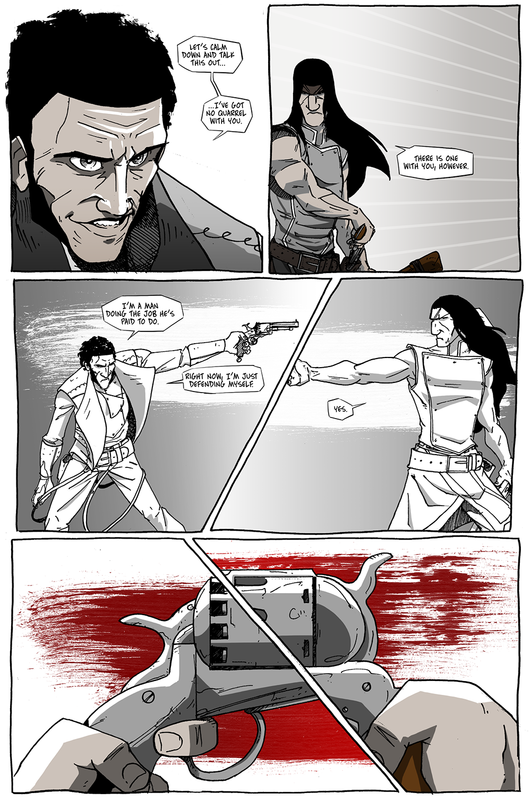 Written and drawn by Melissa Pagluica, it was told online over the course of five years and over 250 pages during the course of which readers not only saw the story unfold and grow but also the sequential skills of the artist herself. I’ve known Melissa for a long time. We met when I helped lead a workshop about how to create webcomics at Empire’s Comics Vault in Sacramento, done so during the tenure of my previous comic and co-hosted by my co-creator, Eben Burgoon. When we were planning the workshop, we had no idea how many people would attend, even preparing for the possibility of having nobody show up. We had been making our comic for a few years at that point, and we felt we had, at least, a squishy bedrock of knowledge that we could share with other ambitious creators. Surprisingly, a handful of attendees arrived at the starting time, Melissa among them. It was weird to have a row of people before you with notepads and pens eager to ask questions and take notes for their own use. We did our best that the time and preparation afforded us, dispensing the wisdom of how to––at that time––get a webcomic, at least, onto the internet and strategies for getting people to see it. Admittedly, I don’t remember much about the workshop aside from receiving many thoughtful questions and meeting a lot of really nice people. At the time, Melissa was already a successful print artist, but she, clearly, had a story she wanted to tell. She started Above the Clouds about a year before I launched Long John, and I was really excited to see what kind of book she would make. I knew it would be beautiful, but I wondered what kind of heart would be beating beneath the signature mercurial linework. Above the Clouds is best described through dissonant comparisons. It is both quaint and epic. It is dreamy and grounded. It is approachable but, at times, oblique. It is simple but, at the same time, a complicated tapestry of themes, ideas, and narrative techniques. The comic was admittedly a learning experience, but it also harnessed the voice of a creator aching to get her voice heard. Quite simply, Melissa created––right out of the gate––a certifiable masterpiece, and she has developed the strength of audience and critical response to back that up. With the comic done, she is publishing the entire story into a collected edition through the crowdfunding site, Kickstarter. To show how much her comic and art have connected with her audience, the $12,000 goal was met within the first two days of the campaign. I’m writing this not because she needs my help with funding and not even because she’s a friend. I’m writing this because her work is the type that you show people, because those who have not seen it need to see it. I’m writing this because her work and success helps to validate the form. But, to be honest, I’m writing this because she’s a webcomicker making good webcomics. She is one of those talents that, I’m sure, has been told that she would always break big, someone who would eventually get a gig with a big studio or publishing company that would finally bring her art to the zeitgeist. The only thing she needed was that break. But that’s the impressive thing about Melissa and her work: she made the break for herself. She just raised $12,000 for her webcomic––something she made from scratch––without any help from a publisher, a co-signer, or brand management firm. She did it on the quality of her work, the earned respect of her peers and readers, and from the focused effort she put in all areas of making a comic, from creation to promotion. In other words, she is one of those comickers that has done everything right––even in the missteps and fumbles that may have been made along the way––because she worked tirelessly and continuously. She deserves all the attention and rewards her Kickstarter campaign and work is receiving because she has earned it. It’s that focus and earnest talent that she has expertly wielded in her book and website, and is why it deserves to be celebrated by supporting Above the Clouds.